The bees are dead. All of them. John is distressed. In the fall, he loaded each hive with fondant (bee candy made from sugar-water) for them to eat. He insulated their hives. They should have been warm and cozy with plenty to tide them over til spring. 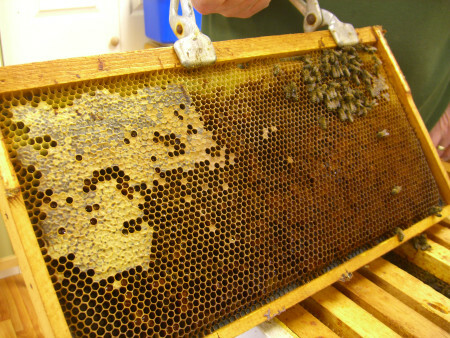 This past week, when he was home on a warmish January day, John visited the hives to check on their fondant supply. He discovered all the bees dead with plenty of honey and fondant still in the hives. Many of the dead bees had fallen to the bottoms of the hives, but small groups still lay in clusters, faces into the frames. It appears to be a classic case of starvation death by cold. Huh, you say? No, it was not Mrs. Peacock in the library with a candlestick. Bees maintain a constant temperature in their hive around 96 degrees. In the winter, they do this by clustering together in a huddle and vibrating their muscles, kind of like when we shiver. As the bees on the outside get cold they move inward and others take their place. (It reminds me of geese flying in the V formation, who take turns in the lead and fall back when they need a break.) If the temperature gets too cold, the bee colony won’t be able to maintain the proper temperature. Or, if the bee colony is lacking in critical mass, they won’t have enough bees to generate enough heat. If bees get too cold, they will stick together to conserve heat and to protect any brood in the hive rather than move over to get food. So, a cold cluster of bees will actually starve to death, even though there is food nearby.Our bees had honey and they had fondant. They had been eating the fondant. They must have gotten cold. Why? It hasn’t been terribly cold here. We understood, a couple of years back, when the bees did not survive Snowmageddon. That was an extreme winter. We had a little bit of snow last month, but overall the weather has been rather mild. So we are confused. One hive died before Thanksgiving. That was disappointing, but since that hive had never been very strong, it was not too surprising. The other three hives went into winter very strong. All three hives had young queens who were very productive through the summer. To lose those hives is very unexpected. One current working theory is that the bees we have been buying from Georgia are not suited to Maryland winters. Georgia is a popular source for bees because the mild southern winter means that bees are ready to be shipped north earlier in the spring than bees from, say, Ohio. An earlier shipment means Maryland beekeepers can have bees taking fuller advantage of the spring blooming. It means getting more honey that first year. Another theory is that something caused a massive loss of adult bees in the late fall. If many bees died off, there would not be enough bees to keep the hive warm. The usual suspects for such a die-off are the varroa mite and the tracheal mite. Mr. Beekeeper did not notice evidence of mites. And Mr. Beekeeper has tossed away the dead bees that were lying in the bottom of the hive. Will the remaining few dead bees on the frames reveal anything? Were they infected with anything or just innocent victims of the cold? 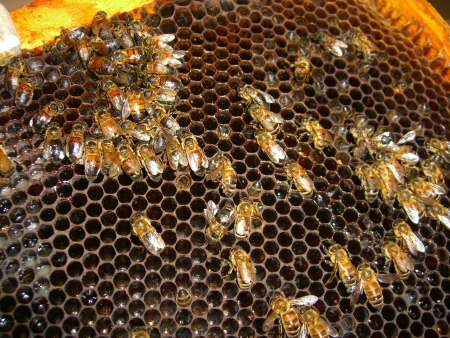 Do we need to do some bee autopsies? I may be a French teacher, but I was really good at dissecting in my 10th grade biology class. Give me some tiny tools. Get me the microscope. I want to KNOW! I had no idea when John starting doing beekeeping that I would have to study bee forensics. We have a mystery on our hands. We need to solve it. Buying new bees every year is a very expensive way to get honey. After four years of this, we were rather hoping to be able to start expanding the number of hives. Instead, we find ourselves with a lot of beekeeping equipment but no bees. Clearly, something needs to change. Last October when we went to the Lima Bean Festival in Cape May, we got talking to a beekeeper from New Jersey. He tipped us off to his preferred bee– the Minnesota Hygienic. He has 150 hives and has never lost a hive of Minnesota Hygienics over the winter. 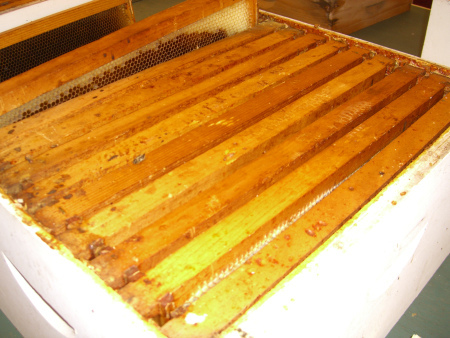 They have the advantage of being bred in a more northern climate and (this is the hygienic part) they keep a very clean hive which greatly reduces their susceptibility to the varroa and tracheal mites. It looks like John will be spending the winter researching a good (northern) source of Minnesota Hygienics. I will carry on my forensic research on the probable cause of death of the Maywood bees. This entry was posted in Mondays at Maywood and tagged beekeeping, Bees, Country Living, gardening, healthy lifestyle, Hereford Zone, hives, Home, Kathy Harp, Maywood Living, Mondays at Maywood, The Zone Magazine. Bookmark the permalink. I don’t know anything about bees but I feel bad for you anyway! 🙂 Hope you find the culprit and can prevent this problem in the future. Thanks! It’s sadly one of the woes of beekeeping. Sorry to hear. The exact same thing happened to our colony last month. And the weather’s been so mild here in Philadelphia… I don’t understand it. It’s heartbreaking. And the prospect of having to shell out the money for new bees is pretty annoying. This is a very common story the world over (well, the parts that get cold–I am an American living in the UK). We have had mild and freezing weather within the space of a month or so in southern England. We get confused, so just imagine what it’s like for the bees! We lost one of our hives to cold as well. When we opened it on a warm day we found plenty of honey and a tiny dead cluster that could not possibly keep itself warm. The other is still doing well so far.